Occasional blog of Tobias Revell: Notes 21: The Return. I have returned from Finland with a quick stopover in Venice for the UrbanIxD symposium and it's straight back to work. Teaching starts next week with greeting new students on Tuesday. I'm excited to be surrounded by people again from the calming but at times trying solidarity of my Finnish exile. However, it is crushing to be back into the slow-motion apocalypse in London after spending time in such a beautiful and wholesome city. I'll be writing a post about my time in Finland which will appear here and in various other places, particularly the blogs of the sponsors and hosts in the next few days. There's also an interview with the Finnish Institute which I'll post when it's out. Towards the end of my time I topped off another Digital Sketch. This one is based on a favourite Japanese print of mine, The Komuso by Wada Sanzo (1940) (above). I was reminded of it while reading Alastair Reynolds' Revelation Space which features a character who dresses as a Komuso. 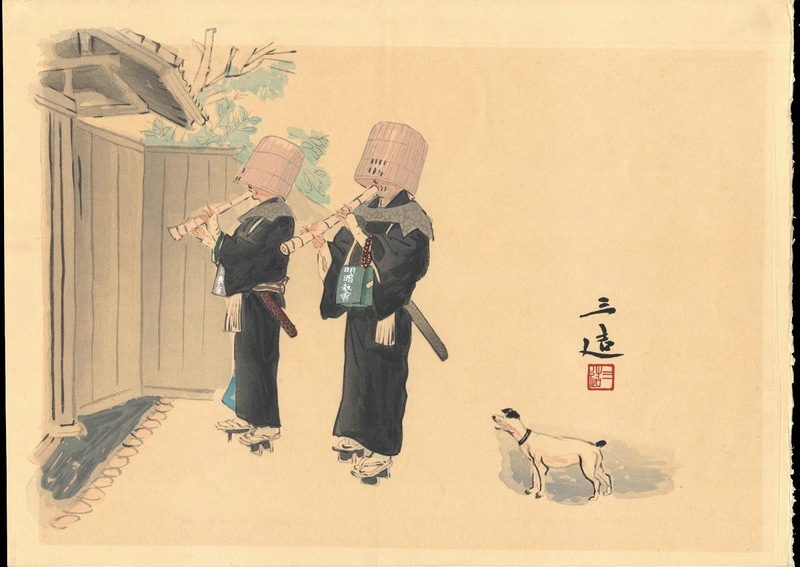 The Komuso were notable monks in that they were allowed to move with relative freedom around feudal Japan which made them excellent spies and assassins. Following the end of BERG, I began thinking a lot about this new type of object that the Internet of Things would leave behind. Discarded toasters, smart fridges and autonomous cars with their startup service layer suddenly extinct will litter the future landscape. I though it would be a good idea to document this as it happened so I've started a tumblr at FormerInternetOfThings.tumblr.com where I'm totally up for taking suggestions. There really aren't many examples of these ghost-less machines yet. But I think in the months to come we'll begin to see more and more of them. Please email or submit things though, for full credit of course. The relationship we have with our technology is becoming divorced from the master-slave relationship predicted by the past and marketed by the present. As our technology becomes more advanced and more connected, it begins to act on our behalf out of our control and often without us knowing. It begins to construct and project realities and worlds that we couldn't have predicted for. This talk will outline and consider some of the side-effects and conflicts that have risen from pervasive networked technology and show indications of how artists, designers and technologists begin to critique and combat them. I'm taking part in the It's Nice That Social at the Design Museum with the designers in residence on October 14th. I'll be doing a little bit of a chat about my work and doing some sort of discussion. Into Your Hands Are They Delivered is on exhibition at Z33 in Hasselt for a while as part of what looks like a pretty damn luminary show - Future Fictions. The rest of the Blueprints For The Unknown projects are there too. I'll be taking part in the Extinction Marathon at the Serpentine on October 18th. We're going to be looking at The Ongoing Collapse sight and potentially speeding it up, using it a little more collaboratively and adding some new data sources over the live weekend. Still need to tighten up the PHP anyway. Thing moves like a tanker. I'll be giving a talk at KIKK Brussels after my time in Australia and Singapore. It's less time so will probably be a shorter version of the Web Directions talk with a little bit of Critical Exploits thrown in. Yeah this is going to be one of the busiest and most intense months in a while, which is refreshing after being away so long. There's also still more news that I can't quite full-beam broadcast yet but you probably already know or at least have inklings about. One day I'll make this thing more than just 'what I'm doing at the moment' and actually offer some considered opinions on things. Until that point I've been greatly enjoying the plethora of mailing lists and daily bites that people have begun to start using. I can only read in envy.